Summer in Nebraska. Hot. Hot. Hotter. What did folks do before air conditioning? 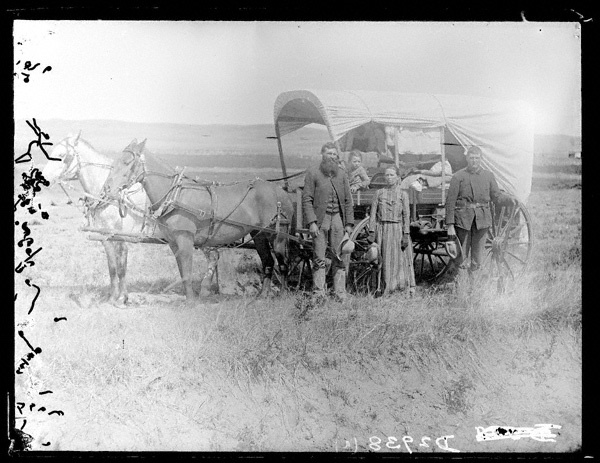 This woman has rolled up the canvas on the wagon sides, undoubtedly to let the breeze blow through ... if there was one. I remember my family essentially moving to the basement of our home for the summer. A whole house fan drew cool night air into our little house, and once the sun came up, dark drapes were drawn to hold in the cool air. We fled down the stairs to the basement, "finished" with paint on the concrete floors and walls. What little cooking we did during the summer was accomplished on an old stove in one corner. At night, fans stirred the air, but sometimes they didn't really keep anyone comfortable. We endured. What kinds of challenges did pioneers face in the summer? 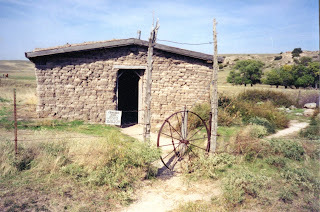 When reading pioneer memoirs, one common theme among those who lived in sod houses was that the three-foot thick walls carved up from the prairie and stacked like bricks kept those homes "warm in winter and cool in summer." Still, with the ever-present wind blowing on a hundred-degree day, I'm fairly certain the pioneer woman's idea of "cool" and mine are very different. "Our only refrigeration in the summer was a long, covered wooden water trough between the windmill and the cattle watering tank. 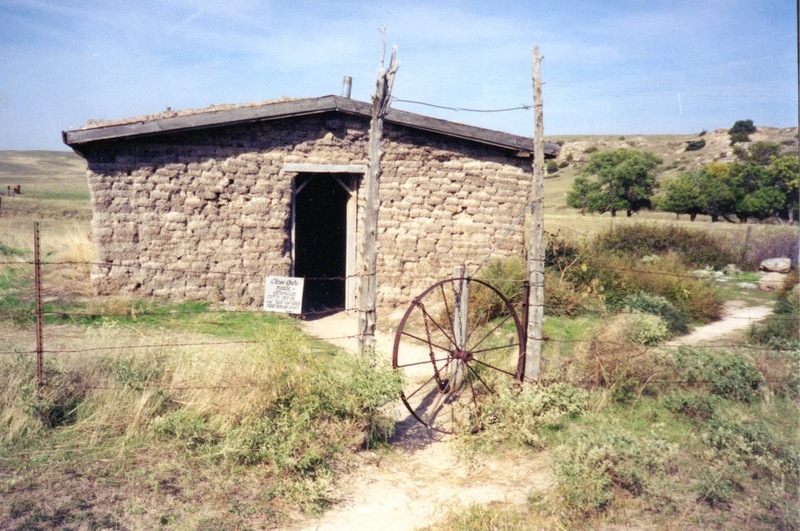 Some pioneers stored butter and milk in a bucket lowered down a well and into cold spring water. Garden produce might be dried, but once canning jars were invented, many a pioneer woman spent hours over a hot stove processing the year's garden bounty to feed her family through the coming winter. In July of 1880, Martha Mott of Nebraska wrote home to Virginia: "No rain ... it requires constant prayer and watching to keep back murmuring ... but ... don't worry about us. He has always cared for us and will care for us still." 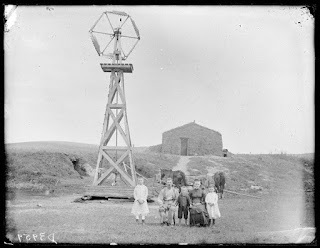 The very next day after writing those words, she added to her letter: "Just as we were completely discouraged, the fain came and a fine one, too...it is too late for the wheat but if it will keep on raining we will have corn." Drought and high winds could combine to set the stage for prairie fires. Once kindled, fire moved across the prairie with appalling speed--often faster than a team of horses could run away from it. 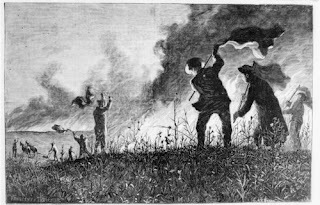 Homesteaders plowed fireguards around their homes--two sets of furrows about fifteen yards apart, with the grass between those two furrows burned. "The same idea often saved travelers caught in the path of a prairie fire. The traveler would burn off a patch of ground large enough so that when standing in the its middle he would not be touched by advancing flames." How about you? Do you love summer or hate it? 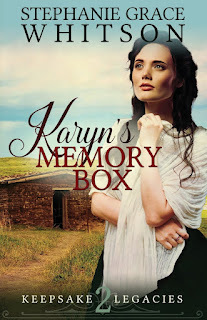 In Karyn's Memory Box, Karyn Ritter encounters a prairie fire. "A sea of fire was rolling toward them, carrying with it black clouds of suffocating smoke ... the horse was wild with fear ... Karyn rolled down a little hill and landed in a patch of bushes beside the creek. Above her flames were licking at the sides of the canyon, crawling down the ridge from tree to tree, making their way relentlessly toward her ..."
That reminds me of a TV movie or two called The Young Pioneers. Davy and his wife went through locusts, etc and even the death of their son. The wife was played by Linda Purl. It is memorable. Thanks for the post. I grew up in a house built in 1836. It had 18” thick cobblestone walls. It was hot in the summer, cold in the northern Illinois winter. Our only basement was a dirt cellar, through a trap door in the kitchen. Back in the 50’s and 60’s not many people had air conditioning. I guess we’d better be thankful for air conditioning! I don't think I've seen The Young Pioneers. Will have to look for it. And I would have thought stone would be just the opposite. Thanks for sharing that. I didn't get air conditioning in my home until 1983. Not even a window unit! Summer, or at least the heat of it, is not my favorite thing, but thankfully we live about 20 miles from the coast of Maine and usually there is a breeze. We will often go there for a ride on the hottest days, and the relief is palpable. Other than that, a/c and fans are our salvation. Maine ... how I'd love to visit that state one day. It is amazing how the sea affects weather and temps even so far inland! I only hate summer when we have had no spring this year will be a very hot and miserable one as we did not have a spring and the temps have be at or close to 100 degree's. When your up and out walking and it around 75 degrees at 7 am it makes for a tough day. You're right, Kim. No spring makes it harder. I enjoy summer by being outside more except when the humidity is so high. Growing up without AC I still prefer windows open vs AC on except when the humidity climbs. I'm a fresh air fanatic, too ... but the humidity makes it hard to stick with it sometimes! Glad you enjoyed the post. Thanks for letting me know. I don't care much for the heat of summer or the frigid cold of winter. We went many years without an air conditioner when our kids were young. We'd go to the library a lot, the $1 movie, and the pool to keep cool. I love writing and reading about pioneers but I think their lives must have been much more difficult than we often show in our books. I remember my dad telling me that come summer, the kids in his family moved their bedding to the porch, where they slept nights until cooler weather arrived. Yes! Summer porches for sleeping! Often off the second story to catch every possible breeze.